Delegate-elect Vanndearlyn Vong (fourth from left) poses with supporters on Saturday, Jan. 12. Vong won a Democratic delegate seat for the 70th Assembly District. Photo courtesy of Vong. Meet Vanndearlyn Vong—a President’s Scholar at Cal State Long Beach, a child of Cambodian immigrants and area Democrats’ newest delegate. Her win, following an election at a Teamsters union hall near Bixby Knolls last Saturday, not only made her the youngest delegate to represent Democrats in the 70th Assembly District—which includes San Pedro, Signal Hill, Avalon and most of Long Beach—but showed the newfound power of a unified Cambodian community. Vong, who said she was flooded with emotion when she found out she won, said she was proud of her community who came out in the hundreds to support her. Charles Song, a leader in the local Cambodian community, called the win historic for the community. The turnout also shows that the community continues to build off of the momentum it experienced during the Measure DDD campaign during the midterm election in November, he said. It establishes an independent redistricting commission in an effort to end gerrymandering and it passed with overwhelming support by voters. While this election is comparably small in scale, Song said he looks forward to building up the younger generation. Members of the Cambodian community turnout en masse on Saturday, Jan. 12 to vote for Democratic delegates who will represent the 70th Assembly District, which includes Long Beach. Photo courtesy of delegate-elect Vanndearlyn Vong. As part of state party rules, each Assembly district elects seven self-identifying males and females each. Candidates sometimes run in slates, like a team, made up of 14 candidates who typically align politically. They can also run individually. These delegates make up one-third of the Democratic State Central Committee, the governing body of the California Democratic Party. Their terms are for two years and they can vote for party officers, help establish the state party platform as well as endorse bills and candidates for legislative and statewide offices. It’s one of the most democratic processes for electing delegates nationwide, said Sergio Carrillo who oversaw the election. He is one of the party’s regional directors and an elected officer for the area. In a region that struggles with low voter turnout, voter participation in elections like this one are even smaller, especially since hours are vastly shorter. On the recent rainy Saturday, registered Democrats had between 10:30 a.m. and 12:30 p.m. to cast their ballot. Nearly half of voters in the 70th Assembly District (49 percent) are registered Democrats compared to just over 19 percent registered Republicans, according 2018 figures from the Secretary of State website. There’s a total of 266,152 registered voters. On Saturday, a total of 725 people registered to vote, according to Carrillo. It is estimated that over 100 Cambodian community members were part of that group. The turnout was more than double what party officers expected, Carrillo said. The official result of the election is still yet to be determined, however. Due to a missing tally sheet some ballots were not counted so a complete recount of the ballots will take place at the Democratic Party headquarters in Sacramento this week. While Sen. Bernie Sanders and President Donald Trump’s election motivated an increase in the number of delegate candidates for the area in 2017 compared to 2015 and 2019, the number of voters stayed high this time around. In 2015, there were 32 candidates and 395 total votes, compared to 62 candidates and 770 votes in 2017 and 32 candidates and 725 votes in 2019. Despite the discrepancy, the final count is likely to still show Vong ahead, Carrillo said. She led the pack with 396 votes, followed by Long Beach nurse and fellow Cambodian American from an opposing slate Pedora Keo with 328 votes. The next highest vote-getter received 254 votes. “I think that speaks volumes to their organizing over the last couple of years,” Carrillo noted of the Cambodian community’s turnout. Vong credits her victory to a vast network comprising family, friends, business and religious leaders and slate-mates. Cal State Long Beach student Vanndearlyn Vong hugs her mom at a Teamsters union hall Saturday, Jan. 12. Vong was elected one of 14 Democratic delegates to represent the 70th Assembly District, which includes Long Beach. Photo courtesy of Vong. 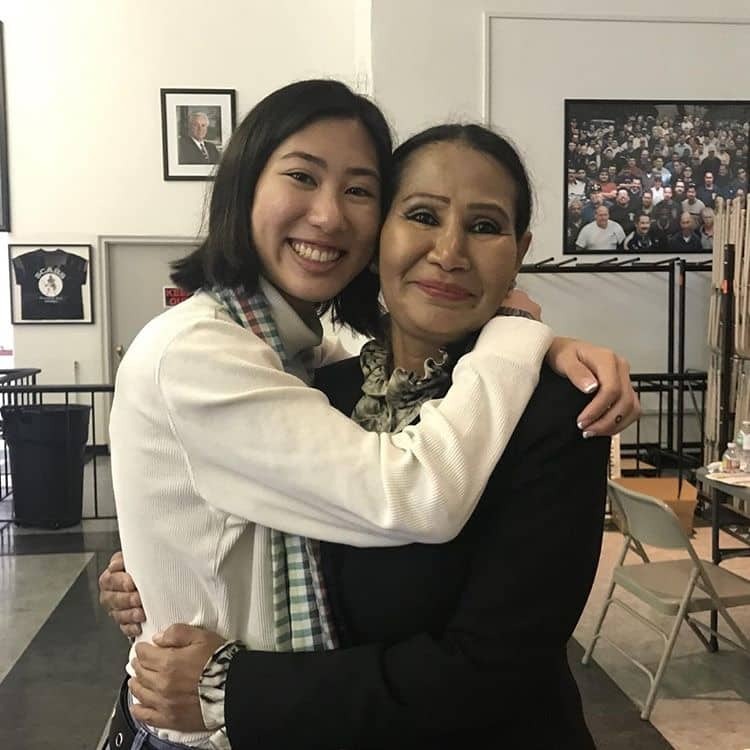 With the help of Song, Vong and her family even spoke—in Khmer and English—to the Cambodian community about the election on Khmer TV, the only Cambodian channel to broadcast in the greater Los Angeles area. Vong also pointed to the experience she gained while working on the political campaigns for Councilman Roberto Uranga and businessman Josh Lowenthal for an Assembly seat. She was able to apply grassroots organizing and Get Out The Vote strategies, registering constituents if needed. Vong said that being raised in a working-class immigrant family, she had to grow up early, and wants to make sure these common struggles are being addressed. Editor’s note: A previous version of this story stated that about 400 Cambodian community members came out to vote based on self-reporting, however, no official count by ethnicity was made.